My buddy gave me an old rod thats still in decent shape. 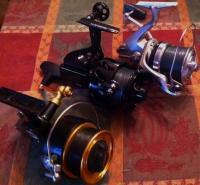 All my reels seem too big for it so I was thinking either a 704z or a 550ss. Would the 704 be too big? A reel that is about the size of a VS 150 would do nicely or even the VS100. Safer bet would be the 150. Too big as in way too big is worse then a bit on the small side. Use what you have and see what happens. Ya i heard 150 is what most guys use on the 9. Is the 550ssg about the same size? A 704 and 550 are completely different sizes. Which one do you own? I guess you need to google up that info. Impossible for us retro dude types to keep abreast of all the reels out there. A 550 is close to the size of a 710. And pretty much what I would recommend for that size rod. Unless the only reel on hand is a 704. And In that case,I'd say fish the damn thing and don't worry about it. It will always work,no matter what anybody says. I shouldve mentioned lol I dont own either one. I only have big reels cause all my rods are 10 and 11 feet. I gotta buy one for this new rod so which would be a better choice ya think? Old Mitchell 306, 406 is good size. I would look into a good condition Penn 710Z. It's a good match for what you want to do. how does the length of a rod determine the most appropriate sized reel? start by determining what line you're going to use and pick a reel size based on how much of your line it holds and how much you need it to hold. 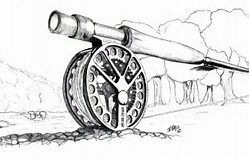 secondary considerations are weight, drag, spool diameter and shape and how these last 2 interact with whatever guides are already on the rod. leave the rod length out of it. If I followed conventional wisdom's oversimplified rod/reel pairings myself I'd have a 704 loaded with 600 yards of 15# braid hanging off an 11 foot salmon rod and in doing so be carrying around an extra pound of metal for no reason. I'd also have a little 2500 sized shimano hanging off my 7 foot jetty chunking rod, hoping I don't hook into a good fish because I only have 40 yards of 30# mono on the spool. Take rod length out of the equation and think about what each reel needs to do, what each rod needs to do, and match them up accordingly and you'd end up with the opposite pairings to what I described above - the little reel belongs on the long rod and the big reel belongs on the short rod. I agree with EB but with braid almost any reel will hold enough line for what we are targetting. I go small and light, even on my longer rods.